Haley was born in Arlington, TX and moved to Houston when she was 11. Haley currently resides in North Houston with her close friends Sarah, Reese, and their 2 year old daughter Paisley Mae. There, she goes by the name “Hay Hay” and spends her time enjoying life drawing “hoo hoo’s” with sidewalk chalk, blowing bubbles, and taking care of her best friend, an 8 year old English Bull Terrier named Acacia. Haley has a love for photography, music, and art. After graduating high school, Haley began working with a photography company in which she photographed a variety of little league sports. She learned a lot on how to operate studio lighting and loved meeting new people on every photoshoot. While working there, Haley met her close friend Inga, who has inspired her to be the artist she is today. Haley is the face of Inga’s photography business, Lady Rouge Studios, where she models different pin up looks Inga whips up. Together, they create beautiful and unique artwork and keep each other sane by utilizing their creativity. After working as a photographer, Haley began working in retail at Interior Fabrics. Her experience there left her with knowledge on how to calculate yardage for upholstery and window treatments, along with a new found love for interior décor. Sewing is one of Haley’s passions, and brings out her machine every chance she gets. Her mom introduced Haley to sewing machines at an early age and taught her everything she knows. It wasn’t until a few years ago when Haley obtained her own machine, and has not stopped creating since. She enjoys making a variety of items, including draperies and window treatments, pillows, blankets, dog beds, table runners, skirts, bags, fabric notebooks, and rugs. During the Christmas season, you’ll find Haley sewing up a storm of Christmas stockings, all of which are unique in their own way, and only one or two of each pattern are made. Fabric is one of her main art supplies, having a countless number of uses. Haley uses different textures of fabric to paint with, as well as creating a palate to paint on. She also uses fabric to manipulate lighting when photographing, with different colored sheers and textures on lamps. Recently, Haley began printing on fabric, giving her many ideas for future projects. When Haley isn’t sewing, photographing, or painting, you’ll find her playing her instruments. She has played the flute and piccolo since she was 11, and picked up saxophone last year when her step dad gave her his from high school. For her, there is nothing more peaceful and relaxing than playing her instruments. Haley is ecstatic to be working at Paulie’s, surrounded by all the creative people of Houston. 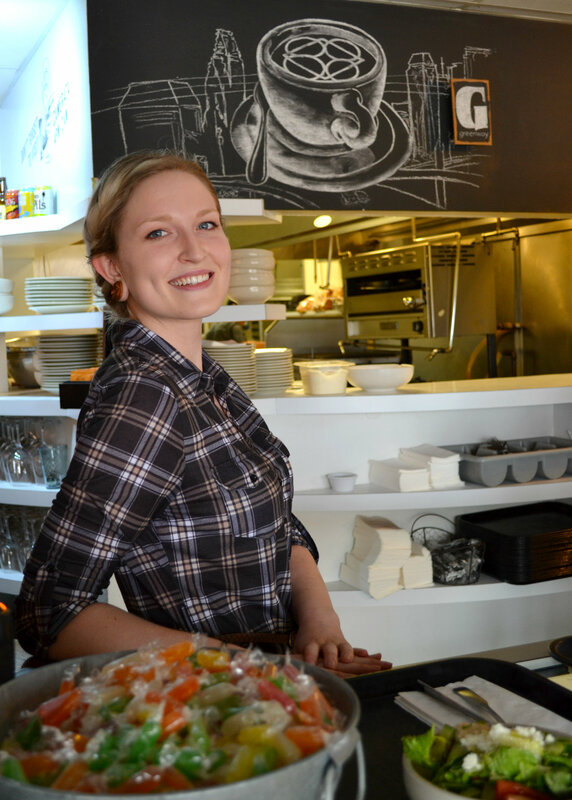 This is her first time working at a restaurant, and has enjoyed learning about our espresso machine, drinks, and overall aspects of working at in a restaurant. She loves the fast pace environment, while still being able to connect with her customers and meet many wonderful people. In the few weeks of being here, she has already met many talented and interesting people and hopes to meet more friends to play music and create art with. This entry was posted on Wednesday, May 13th, 2015 at 5:25 pm	and tagged with barista, coffee, food, houston, restaurant and posted in Uncategorized. You can follow any responses to this entry through the RSS 2.0 feed.